Remind yourself that you always have a choice. Make that choice worthwhile and beneficial for both you and your family financially. The Filipino is culturally hospitable and have a closely knit family ties. I remember one of my friends way back in college who was living an affluent life, but that in a blink of an eye everything was gone because of the untimely death of the parents. Their deaths were a big blow and it took him a while to get back on track. As an eldest child, he was left not only with the responsibility of taking care of his younger siblings but also inherited the burden of paying the debt left by his parents. He made sacrifices, such as making the most of his allowance and giving up his own studies for his other siblings. Some of us may get to meet such a person, classmate or friend and you could even be that person. For those who go through the ordeal, it is a phase that slowly creeps up on you and eat your system. But there’s a rainbow after the rain, and here are the ways to be free from that curse. Raising a family by yourself, while difficult, is a challenge. A parent does not send his children off to college so that when they finally have a job they now support them the rest of their lives. As a child, you need to let your family know from the very start that there is a limit in sustaining them financially. Know when to say “no” and “enough.” Tell yourself that one day you will start building your own family and supporting your parents all the way prevents you from having your own someday. It may sounds rude to many but in reality you are not obligated. Talking with them about this will ease the guilt feelings and put you in a better position. Be very clear with them when extending financial support. Communication is also the key. Often, the approach is also a big factor. The dependents could prove abusive and force you to spend beyond a budget. You are not obligated to shoulder all the expenses. Like the old saying goes, “Teach them how to fish and you feed them for a day. But if you let them sell fish they will eat beef steak forever.” Get a verbal agreement so they won’t take so much of your hard-earned money. Have the courage to ask them not to rely on you solely. A straightforward talk will be a winning solution for you both, especially if you think that most of your money is not well spent. Most of the people I spoke with on giving money to their loved ones feel guilty talking about these things because, for them, money should never be an issue in the family. But I beg to disagree. Money management is the main issue. Since you earn your money the hard way, you should never be guilty asking them not to rely on you all the time. Most families don’t have this fund. They make use of their children or relatives who work overseas as their emergency or alarm funds. They themselves should learn how to create a fund that will sustain them in life-and-death situations. IF you do not invest, your money is being eaten up by inflation. When you put money in a bank, it won’t give you a beneficial return. Instead of allocating so much money to your family, learn how to increase the money that you have by investing into yourself. Don’t just immediately go into the bandwagon or you may end up losing all those money without further studying your risk tolerance, market and how investments work. You will have your own family in the future, but the family you have now will drain you emotionally and financially. At present, 50 percent to 60 percent of your current salary is mostly spent on them. Often, you do not know where the money went. There must be accountability and trust issues that you need to address. Although you give out of love but the money given is not well spent, make a decision to stop so you help them understand how to live without you. If your loved ones drag you and your finances down, there must be something wrong. Follow these simple steps and you may resurrect your dying dreams today. Refrain from supporting your family all the time without telling them the importance of earning and saving. It’s not enough that you earn and give. Proper accountability and stewardship of resources will help you solve the issues you have and help your parents win long term. Remind yourself that you always have a choice. Make that choice worthwhile and beneficial for both you and your family financially. 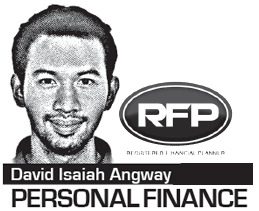 David Isaiah Angway is a registered financial planner of RFP Philippines. He is a Fraud Risk Ops Analysts and have an excellent attention to detail and concern for all aspects of the job. He is also a columnist at Business Mirror.